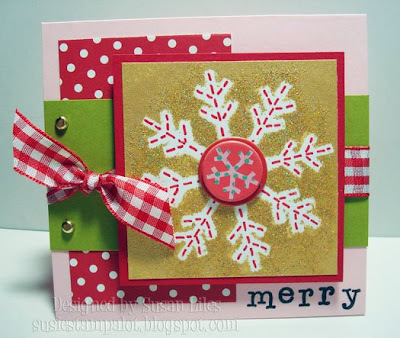 Yes, I actually made this little card solely from scraps. But then again, that's what I do a lot of. Only if cutting into "new" cardstock or designer paper is necessary to complete a card for that perfect color or pattern will I start with fresh paper. Otherwise, I must look into my orphan stash first. That's what I did here! Poor little orphan sadsack card! In fact, remember THIS SFYTT card from a few weeks ago? Well, the gold piece on my new card is the leftover from where I stuck that snowflake down, inked it, and embossed the gold sparkly, almost burning my house down! Yes, I saved it because I knew the "masked" leftover image would be cute as a card itself! Then I added a few more scraps of paper and ribbon. I stamped the "merry" with a new Studio G Clear Alphabet set I got for a dollar a few weekends ago when I went to Imprints in Fort Worth and met up with Sharon and Taylor. I have the same set in wood, but the clear makes all the difference and I just love that font! Anyway, I don't normally post on Sundays, but I have a bunch coming up for you to see and a fun announcement to share later this week--I don't want to fall behind! SUSIE Q-TIP: I'm not saying to save every little tiny scrap that floats across your desk. Only save what will be actual useable stuff. I also ALWAYS cut my scraps down to only squares or rectangles when saving them. No punched out "holes" from different punches. Cut those off of the saved piece. Then later, when you're fishing for scraps, they are immediately useable and will save you time. Love it! I try to use all of my scraps..it seems I hate to throw that beautiful paper away. You never know when you might need just a bit of something. Can't wait to see what you have for us. You give the best tips...Love them!! Gorgeous cards!! Stunning. We all need to take a lesson from your scrap habit. 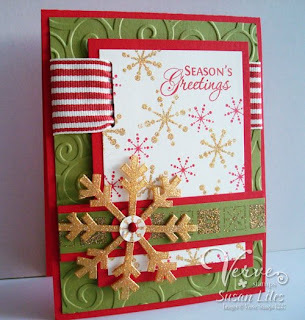 wow totally thinking GREEN..hahaha..i really enjoy your blog and I love the new header great for the season...thank you for sharing your ideas...HaVe A gReAt DaY...Liann M.
LOVE how you used the masked snowflake image! I'm always good about keeping scraps, but I never think about keeping the scrap from a masked image. Sooo cute!